Is there life out there in the Universe? That is a question that has plagued humanity long before we knew just how vast the Universe was – i.e. before the advent of modern astronomy. Within the 20th century – thanks to the development of modern telescopes, radio astronomy, and space observatories – multiple efforts have been made in the hopes of finding extra-terrestrial intelligence (ETI). And yet, humanity is still only aware of one intelligent civilization in the Universe – our own. And until we actually discover an alien civilization, the best we can do is conjecture about the likelihood of their existence. That’s where the famous Drake Equation – named after astronomer Dr. Frank Drake – comes into play. Developed in the 1960s, this equation estimates the number of possible civilizations out there based on a number of factors. During the 1950s, the concept of using radio astronomy to search for signals that were extra-terrestrial in origin was becoming widely-accepted within the scientific community. The idea of listening for extra-terrestrial radio communications had been suggested as far back as the late 19th century (by Nikolai Tesla), but these efforts were concerned with looking for signs of life on Mars. Then, in September of 1959, Giuseppe Cocconi and Philip Morrison (who were both physics professors at Cornell University at the time) published an article in the journal Nature with the title “Searching for Interstellar Communications.” In it, they argued that radio telescopes had become sensitive enough that they could pick up transmissions being broadcast from other star systems. Specifically, they argued that these messages might be transmitted at a wavelength of 21 cm (1420.4 MHz), the same wavelength of radio emissions by neutral hydrogen. As the most common element in the universe, they argued that extra-terrestrial civilizations would see this as a logical frequency at which to make radio broadcasts that could be picked up by other civilizations. Seven months later, Frank Drake made the first systematic SETI survey at the National Radio Astronomy Observatory in Green Bank, West Virginia. Known as Project Ozma, this survey relied on the observatory’s 25-meter dish to monitor Epsilon Eridani and Tau Ceti – two nearby Sun-like stars – at frequencies close to 21 cm for six hours a day, between April and July of 1960. The meeting, which included such luminaries as Carl Sagan, was commemorated with a commemorative plaque that is still in the hall of the Green Bank Observatory today. Whereas N is the number of civilizations in our galaxy that we might able to communicate with, R* is the average rate of star formation in our galaxy, fp is the fraction of those stars which have planets, ne is the number of planets that can actually support life, fl is the number of planets that will develop life, fi is the number of planets that will develop intelligent life, fc is the number civilizations that would develop transmission technologies, and L is the length of time that these civilizations would have to transmit their signals into space. Naturally, the Drake Equation has been subject to some criticism over the years, largely because a lot of the values it contains are assumed. Granted, some of the values it takes into account are easy enough to calculate, like the rate of star formation in the Milky Way. There are an estimated 200 – 400 billion stars within our Milky Way, and modern estimates say that there between 1.65 ± 0.19 and 3 new star form every year. Assuming that our galaxy represents the average, and given that that there are as many as 2 trillion galaxies in the observable Universe (current estimates based on Hubble data), that means that there are as many as 1.5 to 6 trillion new stars being added to the Universe with every passing year! However, some of the other values are subject to a great deal of guess work. For example, estimates on how many stars will have a system of planets has changed over time. Currently, it is estimated that the Milky Way contains 100 billion planets, which works out to about 50% of its stars having a planet of their own. Furthermore, those stars that have multiple planets will likely have one or two that lies within their habitable zone (aka. “Goldilocks Zone”) – where liquid water can exist on their surfaces. Now let’s assume that 100% of planets located within a habitable zone will be able develop life in some form, that at least 1% of those life-supporting planets will be able to give rise to intelligent species, that 1% of these will be able to communicate, and that they will able to do so for a period of about 10,000 years. If we run those numbers through the Drake Equation, we end up with a value of 10. In other words, there are possibly 10 civilizations in the Milky Way at any time capable of sending out signals that we could detect. But of course, the values used for four parameters there – fl, fi, fc and L – were entirely assumed. Without any real data to go by, there’s no real way to know how many alien civilizations could really be out there. There could just be 1 in the entire Universe (us), or millions in every galaxy! This simple question summarized the conflict that existed between arguments that emphasized scale and the high probability of life emerging in the Universe with the complete lack of evidence that any such life exists. While Fermi was not the first scientists to ask the question, his name came to be associated with it due to his many writings on the subject. In short, the Fermi Paradox states that, given the sheer number of stars in the Universe (many of which are billions of years older than our own), the high-probability that even a small fraction would have planets capable of giving rise to intelligent species, the likelihood that some of them would develop interstellar travel, and the time it would take to travel from one side of our galaxy to other (even allowing for sub-luminous speeds), humanity should have found some evidence of intelligent civilizations by now. Naturally, this has given rise to many hypotheses as to how advanced civilizations could exist within our Universe but remain undetected. They include the possibility that intelligent life is extremely rare, that humanity is an early arrival to the Universe, that they do not exist (aka. the Hart-Tipler Conjecture), that they are in a state of slumber, or that we are simply looking in the wrong places. As with many other cosmological mysteries, we’ll be forced to guess about what we don’t know based on what we do (or think we do). As astronomers study stars and planets with newer instruments, they might eventually be able to work out just how accurate the Drake Equation really is. And if our recent cosmological and exoplanet-hunting efforts have shown us anything, it is that we are just beginning to scratch the surface of the Universe at large! In the coming years and decades, our efforts to learn more about extra-solar planets will expand to include research of their atmospheres – which will rely on next-generation instruments like the James Webb Space Telescope and the European Extremely-Large Telescope array. These will go a long way towards refining our estimates on how common potentially habitable worlds are. We have written many articles about the Drake Equation for Universe Today. 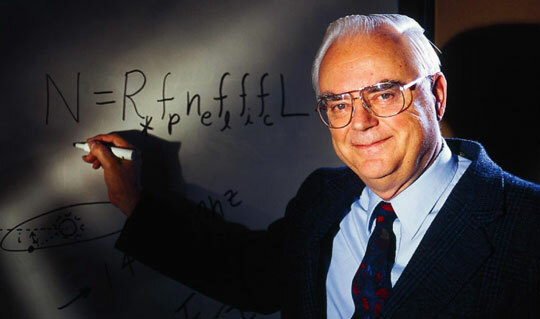 Here’s Inside the Drake Equation: A Chat with Frank Drake, The Odds of Intelligent Life in the Universe, A New Drake Equation? Other Life Not Likely to be Intelligent, A New Drake Equation for Potential of Life, Bayesian Analysis Rains on Exoplanet Life Parade, and Where are all the Aliens? The Fermi Paradox? There are some great resources out there on the Internet. Check out this Drake Equation calculator. We have recorded an entire episode of Astronomy Cast about the Drake Equation. Check it out here, Episode 23 – Counting Aliens with the Drake Equation. This is a great conversation that alternates between Drake’s current work with SETI and the history of his work that led to the famous Drake Equation. Fraknoi and Drake have an interesting exchange about the value of N, which is the number of civilizations in The Milky Way Galaxy whose electromagnetic emissions would be detectable. It was recorded in June 2012 at an event called SETICon, which featured a series of talks, panels, and events featuring scientists, authors, futurists, and film-makers. Fraknoi is a professor of astronomy and also works with the Astronomical Society of the Pacific and they have made available a written history of Frank Drake and his equation. It’s about fifty years since Frank Drake sent out our first chat request to the wider universe. I say about as I think the official date is 11 April 1960 – but I notice a lot of fifty year anniversary blogs and interviews are already being published, so what the heck, I’m not waiting either. While no-one is really concerned that we haven’t had an answer back yet, it is a little despondent to have scanned the skies for someone else’s chat request all this time and found nothing. In a recent New Scientist interview (actually January 2010 – they were really getting in early), Drake refers to his equation delivering an answer in the order of one in 10 million stars having an advanced civilization – and he uses that statistic to indicate it’s too early to think we have done a statistically adequate scan yet. Nonetheless, the chances of there being advanced civilizations near enough to enable a future United Federation of Planets already looks doubtful. Drake’s initial communication efforts in Project Ozma were small scale, but his clever and carefully constructed Arecibo message out to Messier 13 (a globular cluster of approximately 300,000 stars) in 1974 aroused some criticism that telling the aliens where we are might result in an invasion. This is a little implausible, since Messier 13 is 25,000 light years away. By the time the invasion fleet arrives we will either be long gone or have spent the intervening period developing the technology to blast them out of the sky if they don’t turn back immediately. The Arecibo message composed of 1679 bits, being the product of two prime numbers 73 and 23 (i.e. the number of rows and columns). Impressive, huh? Anyway, here in the 21st century, I want to suggest that more attention should be given to us just not looking stupid. There’s already all the bad TV out there. We can fairly claim that all that was never meant for alien consumption, but recently we advanced humans have quite deliberately transmitted a Beatles song to Polaris and sent a bunch of text messages to Gliese 581. I mean, huh? Polaris, being a Cepheid variable – and in any case a short-lived and already dying supergiant – was probably never stable enough to support planets, so we probably got away with that one. However, there’s no getting around us sending text messages to Gliese 581c in 2008 (from Ukraine) and subsequently following that up with another set blasted at 581d in 2009 (from Australia, sorry…). This was because when we recalculated, it was apparent that the exoplanet 581d was more likely to be in the habitable zone of its star than 581c. Hopefully those 20 light year distant aliens will appreciate that the inconsequential shift in the main focus of those two transmissions is an indication of our extreme cleverness. See, it’s a bit like reading Shakespeare to a dolphin. With no comprehension of the language, you will just look like someone who is content to sit for hours making funny noises while dangling your feet in a pool. But with a bit of comprehension, the dolphin can be reasonably expected to reply – hey Brainiac, I’m a dolphin, what’s forsooth mean? There are aliens among us who already think we’re a bit daft. How about we first check in with Frank Drake next time we feel like shouting out the window? The famed Drake equation estimates the number of technologically advanced civilizations that might exist in our Galaxy. But is there a way to mathematically quantify a habitat’s potential for hosting life? “At present, there is no easy way of directly comparing the suitability of different environments as a habitat for life” said Dr. Axel Hagermann, who is proposing a method to find a “habitability index” at the European Planetary Science Congress. Hagermann and colleague Charles Cockell have the ambitious aim of developing a single, normalized indicator of habitability, mathematically describing all the variables of each of the four habitability criteria. Initially, they are focusing on describing all the qualities of an energy source that may help or hinder the development of life.